If you live in Maine, chances are that you’ve heard the name Maddy Corson. 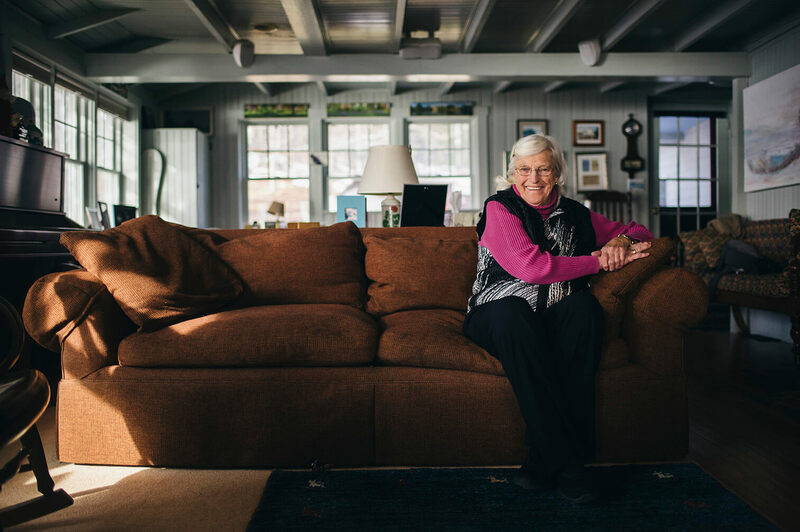 The octogenarian has been a fixture in nonprofit and philanthropy spheres for decades, and her ability to connect people is her superpower. She is a longtime supporter of organizations that promote theater and the arts, assist children and families and uphold justice for women and immigrants. Corson graduated from Wheelock College with a teaching degree, briefly taught kindergarten music in Canada and in Burlington, Vermont, and raised four children. She was a member of a family trust set up to manage her grandfather’s, Guy Gannett’s, publishing and communications company that included The Portland Press Herald, two other daily newspapers and seven network affiliate stations. After her aunt had run the company for many years, Corson was elected to the board of Guy Gannett Communications in 1981. She had never been involved in any business but found mentors along the way who helped her learn what she needed to be successful. She became chairwoman of the board in 1994 and oversaw the sale of the company in 1998. Corson, who is a Maine resident, recently spoke with Maine Women Magazine about the path she took to, in her words, “find her place” in business, philanthropy and life. Q. What was it like growing up in an influential and prominent Maine family? A. I had a great childhood. It was a free childhood. We all roamed around on our bikes. Parents never knew where we were. We came home for lunch. We came home for dinner. I was naughty. I was in the principal’s office a lot. They sent me away to boarding school, and even though boarding school wasn’t a punishment, I sat back and looked at myself and thought, ‘I need to make a change’. When I arrived at boarding school, my name was incorrect on my dormitory door. Instead of Madeline they had posted my middle name, Jean. So I took that name while I was in boarding school, and I was changed for four years. That was a turning point for me to be a better person. It was a conscious decision. I put the energy that I’d used to be naughty and lead my friends in a bad direction when I was Madeline, in to being a leader and class officer in the school as Jean. Q. You got a teaching degree from Wheelock College and then raised your four children. Do children influence your philanthropy decisions? A. The Children’s Museum & Theatre of Maine is the nonprofit I focus on the most and it was my original baby. My interest in their young children component is directly influenced by my time at Wheelock and teaching. In theater, the children gain confidence. The arts bring joy to people’s lives and teach about teamwork. If you’re in any theater—acting, the ballet, you could be the lighting person, or the set designer—you’re part of a team. Q. When and how did you find your path at Guy Gannett Communications? A. Finally 50 and just getting started! I felt free to be me as opposed to doing what others thought I should do. I wanted to keep busy, so it was great to go into Gannett and find where my place was. I was an owner, but I’d never worked there before. I was winging it. I felt lost, because I didn’t know what I was doing on a path that was handed to me without a job description. I was brought up in a family where we talked about broadcasting, and I was an owner of a media company. Because of that, the perception of me was a lot different than the reality. On the inside I was shy and scared, on the outside I was being asked to be on committees and do things. Q. How did you get over that shyness enough to chair the board? A. At first, I brought my husband (they were divorced soon after her 50th birthday) with me to the board meetings because I was so scared. I‘d get this feeling in my chest, and I couldn’t bring myself to ask a question. It was physical. So, I listened, and I listened, and I found out that the questions more sophisticated people asked were the questions I had in my own head. That gave me confidence that if I could get over the physical thing, I could ask my questions. Q. And did your shyness ever go away? A. Over time, I’ve learned. Touching someone on the arm. Giving a hug. Reaching out helps me get over my shyness. Q. How did being an educator influence your dive into the nonprofit sector? A. The teacher component of me was wonderful. I love people. I love to cheer them on. I was a big cheerleader in the nonprofit world. I went on two boards: Multiple Sclerosis and Portland Ovations, and they taught me a lot. I went day by day. People from the nonprofit sector taught me. Q. Did you have any specific mentors who helped you? A. Yes. Mentors are so important. Surround yourself with people you know, and trust those who know their area of expertise. Bettsanne Holmes (a chair and active member of many Maine health organization boards including Maine Medical Center) was on the broadcasting board. She took me under her wing and taught me about running meetings, being on time and planning events. She was strict, and she was my dear friend until her death. Frannie Peabody, too. She was always dressed impeccably. Her grandson had AIDS and she started the Frannie Peabody Center. Q. How did you decide which organizations to fund, and how has your support changed those organizations? A. There really wasn’t a plan; my giving came from the heart. I gave seed money, not much, but enough, to some tiny nonprofits. They would use it as a challenge and then double their money. One example that I love was a nonprofit that came to me with a funding need for an iPad program for special needs kids. They called my donation “The Maddy Challenge” and then they got matching funds from donors and, ultimately, a foundation. Q. In addition to money, how have you been involved in the success of nonprofit organizations in Maine? I love executive directors. Many times executive directors feel very alone. Often, they can’t tell their real troubles to their boards. So I would get them in a room at the Cumberland Club, and they would confess to me that they were having trouble. When people come to me about a new nonprofit, I almost have to quiet them down, because they’re so excited and possibly going in all directions. These people energize me. I send them to others who can help. I’m a connector. I didn’t know that I had that, but I’ll talk to someone, and I’ll know who they need to talk to. I’ve been very lucky that when I call people [to] help out, they say, ‘Yes.’ I’ve never had anyone really say, ‘No.’ These are the people who inspire me. Anna E. Jordan (annaejordan.com) is a writer and editor. Follow her at @annawritedraw for news about #kidlit, rowing and politics.